Empty Nose Syndrome (ENS) is a very difficult condition caused by damage to the inside of the nasal cavity, usually associated with surgical resection of tissue. Many patients who experience these symptoms will have problems with their nose which are counterintuitive in their presentation. Intial work by Dr. Eugene Kern (formerly Mayo Clinic, Rochester) established that a condition of atrophic rhinitis is created in some patients after nasal surgery. This leads to feelings of paradoxical nasal obstruction and significant crusting or nasal dryness. In general, most patients who experience ENS have some form of turbinate reduction or removal. You can see this video lecture from Dr. Kern where he explains his findings and medical rationale. The phenomenon of ENS is not universally accepted in the ENT/Otolaryngology community and as such is not universally treated. Fortunately, the condition itself is gaining wider acceptance and more physicians who treat sinus and nasal disorders are becoming familiar with it. The American Rhinologic Society does acknowledge that it is a condition and they do have it listed on their website as such. The diagnosis of ENS is somewhat difficult but can be suspected when either physical examination or imaging indicates a large removal of nasal tissue which contributes to the airflow. 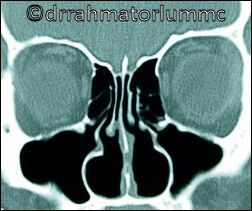 This can be tissue of the inferior turbinate, middle turbinate, or medial maxillary wall. A “cotton test” was initially proposed as a relatively simple way to determine if increasing resistance the nasal cavity would alleviate patient symptoms. Sometimes this can be done too good effect and be significantly helpful in determining the diagnosis. Dr. Kern, had done significant work on rhinomanometry or nasal airflow analysis to provide an objective root of diagnosis. The overall incidence of ENS after nasal surgery is unknown. Because there is no uniform definition nor uniform acceptance within the profession, there has not been a large-scale study of the number of patients who encounter this condition after nasal surgery. Dr. Kern and Dr. Eric Moore, published a case study of 242 people with atrophic rhinitis attributable to ENS. This was the first known reference in the scientific literature to such a condition. The origins of the condition of atrophic rhinitis is discussed as well as measures of prevention, and some suggestions of treatment in this article. It is important to understand as a patient if you have seen healthcare providers that have dismissed the symptoms that you seek out physicians who are knowledgeable in the area of Empty Nose Syndrome. There are several occasions where patients have become violent or committed suicide when they felt as though the health care system did not recognize their unique condition. If you are having problems please consider talking with your primary care physician and research your local Otolaryngology physicians to determine which ones have experience with Empty Nose Syndrome. “Having Nasal Surgery? Don’t You Become an Empty Nose Victim!” by Christopher Martin.